In the last few months, the deaths of independent and military contractors in Iraq have been much in the news. According to the Brookings Institution, there are more than 15,000 security contractors in Iraq, making independent contractors the second largest force after the U.S. military. Recently, the Department of Labor has issued statistics about workers compensation claims for U.S. contractors, including those in Iraq. Of the 771 workers comp claims filed by U.S. contractors so far this year, 345 occurred in Iraq. Of the 66 deaths, 57 occurred in Iraq. Workers compensation for contractors is mandatory under the U.S. Defense Based Act (DBA) of 1941. Coverage applies to both U. S. workers and any foreign subcontractors who are not covered under their own country’s workers comp laws. Since Iraqi contractors are not covered by workers comp, any contractors must be covered under the DBA. According to the DOL, there are three major insurance carriers currently providing DBA coverage in Iraq: ACE-USA, AIG, and CNA, although there are more than 700 carriers and self-insured employers authorized to write coverage under the Longshore and Harbor Workers’ Compensation Act. “Labor Department officials said they had no cost estimate for reimbursements of Iraq-related claims, but given the maximum payment of $1,030.78 per week and the number of injuries and deaths, it could well climb into the multimillions. In past years, annual reimbursement costs under the War Hazards Act have ranged from $1 million to $2 million. …Rates have ranged from an early low of $10 per $100 of an employer’s payroll to as much as much as $40 per $100 of payroll in recent months, said Hartwig of the insurance institute. That means an employer with a million-dollar payroll would pay between $100,000 and $400,000 in premiums. The Weekly Toll – In his Father’s Day post, Jordan Barab at Confined Space recounts last week’s workplace deaths, noting the children who must grow up without fathers and the fathers who must bury their sons. It should serve as a sobering reminder to all of us who work in this business what our work is really all about: keeping workers safe on the job. Summer Electrical Safety Tips for Kids – these are good rules for kids of all ages, actually. Thanks to rawblogXport for the pointer. 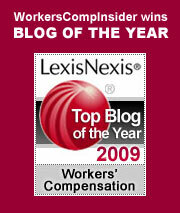 Michigan Comp Law features a recent post on the cost of workers comp claims in Iraq. We’ve been meaning to post on this topic too, perhaps we’ll add to the discussion later this week. Tom Peters has a weblog. Welcome to the “blogosphere,” Tom. We’ve just posted an article that Tom Lynch authored for the Winter 2004 edition of The Journal of Workers Compensation entitled Good Grief! Does Our Future Lie in California? Although the article was published just prior to the ouster of Grey Davis and the subsequent adoption of a workers comp reform plan, the overall examination of why some states work well and why some *break* may be instructive. The United States did not invent workers compensation. That honor goes to Germany, which first introduced the concept in 1884. By the middle of the 20th century, most countries throughout the world had some kind of workers compensation or employment injuries legislation. Some systems take the form of compulsory social insurance; in others, the employer is legally required to provide certain benefits, but insurance is voluntary. In most countries, employers finance some type of employment injury benefits for workers. In common law countries, such as the United States, workers compensation is based upon a doctrine of strict liability, or liability without fault. This is a departure from the principle of tort law in which the injured party receives no damages unless it can be shown that someone else maliciously or negligently caused the damage. The rationale for the “social fault doctrine” is that, under conditions of modern industrial employment, employers are in the best position to prevent accidents and disease, and they should therefore be given economic incentive to take preventive action. In 1911, after failed legislative attempts in Massachusetts and New York that had been ruled unconstitutional, Wisconsin successfully followed the lead of Germany and England and became the first state in America to enact a workers compensation statute. Over the next few years, the rest of the nation followed suit. Today, our 50 states have 50 different laws. One might be tempted to say that what we really have are 50 bottles of identical wine with 50 different labels, but the differences go far beyond that. Benefits differ by state, as do systems for medical reimbursement. The workers compensation system in most states operates through some form of private insurance, but in some states, such as Ohio and West Virginia, the system is operated by the public sector; there are even two states, Texas and New Jersey, that make workers compensation insurance optional for employers. The differences that abound among the states in their approaches to workers compensation lead to some states having economically “healthier” systems than others. Nowhere is this difference in wellness more vivid than in California, the state that, if it were a country, would have the fifth leading gross national product in the world. (Read the full article). If you asked the average “man on the street” to name dangerous professions, chances are nursing and other healthcare professions wouldn’t make the list. Yet according to the Bureau of Labor Statistics, hospitals have the second highest rate of nonfatal injury or illness cases. Many of the risks are well known: back injuries and musculo-skeletal disorders from lifting patients; exposure to blood-borne pathogens; and injuries resulting from assault by patients. The NIOSH alert is a “prepublication” report that will undergo further editing before a final release sometime this year. The final report will present a voluntary guideline that will include information on more than 100 drugs and will offer detailed recommendations for control measures that should be taken by employers and employees to reduce risks. Many measures assumed to be adequate in the past may not be sufficient protection in response to the risk. “Exposure may occur in these situations: Drugs are reconstituted or diluted. Nurses or others expel air from syringes or give injections, and small amounts are aerosolized. Uncoated tablets are counted or dosed in a unit-dose machine. Health care workers touch contaminated surfaces, patients’ body fluids, or contaminated clothing and linens. Workers prime the IV with drug-containing solution or administer the drug with the IV. Requests for printed copies when they become available can be made through the NIOSH toll-free information number, 1-800-35-NIOSH, or by contacting the NIOSH Publications Office through the NIOSH web page. As we near the summer hiring season, LynchRyan reminds employers that workers compensation laws do not distinguish temporary hires from regular year-round employees. Anyone who works for you, no matter for how long, is protected by workers compensation. This is as it should be. First, do not allow these new hires to operate heavy equipment. Indeed, you should probably not allow them to operate any equipment that entails risk. In one tragic case from last summer, a high school student in Massachusetts was killed when he ran a fork lift off of a loading ramp. In addition, never assume that a summer hire knows how to do the work, no matter how simple the task may appear. Whether it’s pounding nails or filing, summer hires need guidance and supervision. Doing a job the right way is not necessarily something students have learned in school. Finally, if you have young people on the summer payroll, don’t just “toss them the keys.” Young people are, by definition, inexperienced drivers. Unless you know them and their driving habits very well, keep them busy in safe activities other than driving. Youthful exuberance is a wonderful quality — but not when it comes to driving or operating equipment. It’s your responsibility as an employer to make sure that this first or second job experience is not the student’s last. The three-year Terrorism Risk Insurance Act (TRIA) is set to expire December 31, 2005 unless Congress acts to extend it. This is of great concern to insurers who will soon be negotiating and writing business insurance policies for 2005 and beyond. Any policies that are written after 1/1/05 will not be fully protected by federal backstop insurance. “The commercial property-casualty insurance sector continues to lack the financial capacity to handle catastrophic terrorism losses on its own. Certain plausible event scenarios estimate insured losses from another catastrophic terrorist attack on U.S. soil could exceed $250 billion, far exceeding the entire commercial property-casualty industry’s estimated capacity. Backstop insurance is of particular concern in workers compensation. Workers comp is different from other types of insurance where events occur and they are paid for within a short amount of time. Workers comp claims have a long tail by their very nature, meaning that payment can extend over many years after the original event. Insurers must maintain reserves to cover the expected cost until the claim is closed. With the September 11 event, workers comp insurance was on the line for the death benefits for workers killed in the attack; it is also the “exclusive remedy” for any workers who sustained injuries during the attack, or who were in the “course and scope” of employment during the extensive cleanup projects in the aftermath of the attack. Recently, we’ve seen alarming reports that the dust from the World Trade Center attacks is more toxic than originally estimated, and that the associated range of health problems may be severe. We may have only seen the tip of the iceberg in terms of survivor health problems. This is a dramatic example of the “long tail” claims that can be associated with workers comp. Business Opportunities Weblog – Dane Carlson blogs entrepreneurial ideas and opportunities. Michigan Comp Law – a weblog hosted by the law firm of Ryan, Jamieson, Morris, Ryan and Smith that provides updates and information on workers compensation law in Michigan. Thoughts from a Management Lawyer – attorney Michael Fitzgibbon’s weblog about Canadian labour and employment law issues. Heart attacks on the job: are they covered by workers compensation? Lately, we’ve had several visitors to the site searching for information about heart attacks. We take that to mean that people are trying to determine whether a heart attack that occurs in the workplace is a compensable event. Not everything that occurs in the workplace is deemed compensable and that is particularly true of illnesses. Generally, a heart attack in and of itself would not be a compensable event. The acid test for compensability would revolve around whether it can be determined that the heart attack is an event that has arisen out of and in the course of employment. First, as with anything related to workers comp, your state law will prevail. Because workers comp legislation varies by state, there is no universal dictate that would apply nationally so we are speaking in generalities here. Heart attacks and strokes can be complex issues and may require legal consultation. “Arising out of employment” means that a heart attack would have to be job related, or in other words, did the heart attack happen because of the work? Was there a causal connection? “In the course and scope of employment” generally would have to do with the time, place, and surrounding events. Illnesses and conditions are often progressive in nature, and they may be due to other or unknown causes, such as family history, obesity, smoking, etc. It would be up to the worker to prove that the heart attack was related to or caused – at least in part – by the work. Were there precipitating work factors, such as unusual physical exertion or mental stress? Also, in any discussion of heart attacks, the issue of pre-existing conditions often comes into play. While pre-existing conditions would generally not be compensable, they would also not necessarily be a bar to compensability. If it can be shown that the work aggravated or accelerated a pre-existing condition, compensability may be granted.